Shefford & Sandy produced a high intensity performance to defeat Norwich Dragons 6-2 at the weekend with goals from Chris Seward (2), Chris Fell, (2), Alyn Meredith and Stephen Williams. The IIs turned in their best performance of the season to put an end to Stevenage’s 100 per cent record with a hefty 5-1 triumph. S&S started at a ferocious pace as they went 2-0 up through Lewis Bridger and Peter Reed. The goals kept coming, as Shefford added a further two by the break, as Danny Price set up Bridger for his second, with the youngster then completing a first half treble. After the interval, S&S keeper and star man Dom Wright was in fine form, while Robbie Stevens came close to a fifth. Stevenage did pull one back, but Bridger then turned provider, setting up Steve Brookes’ strike as they moved top of Division Six SW.
S&S: Dom Wright, Dan Robins (c), Jake Danson, Matt Radley, Ollie Sole, Chris Reilly, Daz Hepburn, Danny Price, Peter Reed, Steve Brookes, Stuart Perry, Robbie Stevens, Lewis Bridger. 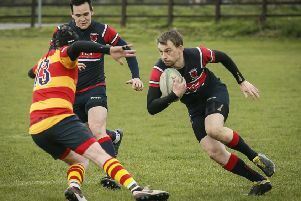 The IIIs won 3-1 at promotion rivals Royston IVs in Division CHECK maintaining their 100 per cent record this season. Angus Monaghan, James Morris and Graham combined for Steve Ashdown to slam home the opening goal after just two minutes. The visitors lost Graham to a head injury moments before the break, but upped the tempo in the second period as Ryan Devlin, Matt Stevenson and star man Morris impressed, while Monaghan and Grant Kirby stretched the play, with Ethan Pennington and Kev Orchard joining the attack too. Adam Symons doubled S&S’s lead shortly before scoring his second and Shefford’s third from an acute angle as Royston’s late goal was a mere consolation. The IVs hammered Berkhamsted 8-0 in their East Mens’ Division 9SW clash. James Masters broke the deadlock early on, before skipper Trevor Bridger added a second. Further goals came from Ed De Luca and Masters as Shefford led 4-0 at the break. After the interval, Masters completed his hat-trick, while Elliot Wood netted twice, the first a fantastic solo effort, and Andrew Moore finished the scoring. S&S: James Steer, Joe O’Sullivan, Dan Coverdale, Ed De Luca, Paul Angell, James Masters, Andrew Moore, Darren France, Elliot Wood, Trevor Bridger, Alistair Wood, Zach Christodoulou, Jamie Parkes. Shefford & Sandy Ladies II bounced back from last week’s disappointing defeat with a resounding 8-0 win over Letchworth IIIs. It was not long before new recruit Charlie Field got her name on the score sheet, closely followed by veteran Kirsten Rayner’s close range effort. The start of the second half saw S&S bag two early goals from a great individual effort from Sophie Harris, as her intricate stick skills outfoxed the defence, and then Field’s mazy run resulted in the fourth. Rayner notched her second. Star player Field completed her hat-trick while Kath Wilson netted a first of the season and Tina Fury converted a short corner in the dying seconds. S&S: Lian Potter, Gina Kelly, Kaz Hall, Hannah Bartram, Sammi Saxon, Nat Nunn, T Fury, H Cakebread, Sophie Harris, Charlie Field, Kath Wilson, Kirsten Rayner.